You naturally produce Glutathione molecules to protect every living cell in your body. We also attack our liver near constantly without even realizing it. Acetaminophen is a tricky analgesic. The effective therapeutic dose to relieve your pain is often dangerously close to a toxic dose. When your body processes acetaminophen it produces a number of compounds, mostly harmless. Unfortunately one of those by-products is N-acetyl-p-benzoquinone imine or NAPQI which is usually only produced in small amounts and immediately detoxified from your liver. When you pop too many pain relievers containing acetaminophen you end up with more NAPQI than the body can handle and cause liver cell damage rather quickly. Traditionally N-Acetyl-L-Cysteine or NAC has been used to treat acetaminophen overdose by doctors with tremendous efficacy. NAC allows your body to very greatly increase glutathione production for a short period, and the tripeptide GSH molecule is your body’s best defense in clearing toxins from the liver. 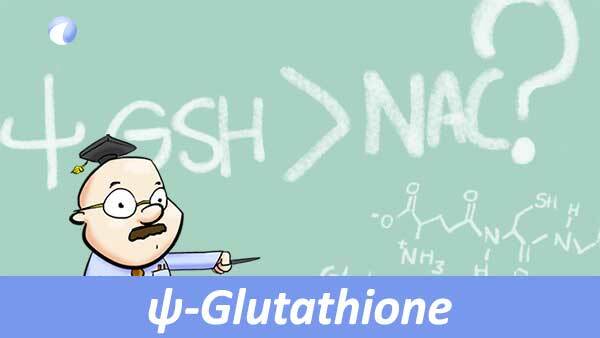 Glutathione research continues along and there are new opportunities with a form of ψ-Glutathione. ψ – The Greek character for “psi” is structurally very similar to a glutathione molecule, but different enough that it won’t be metabolized by the body. Instead, this new, and extremely promising mouse study from the University of Minnesota suggests it latches to the NAPQI molecules (the harmful bi-product of using acetaminophen) and clears them out before damage is done. In this way, the ψ-GSH is able to block damage. More importantly based on the research in this new study using liver ALT levels to measure, ψ-Glutathione may do more to protect the liver even after a longer delay of treatment. While ψ-Glutathione is relatively new in research terms, it’s promising as a new even better alternative to NAC for dangerous acetaminophen overdoses. In the mean time it’s best always to think twice before popping Tylenol or other acetaminophen-based analgesics without thinking. The idea that they are benign is a myth and your liver will thank you over the long term. As we’ve discussed before your liver, while resilient, is critical and central to your overall health. Don’t add to the strain on it if you don’t have to.